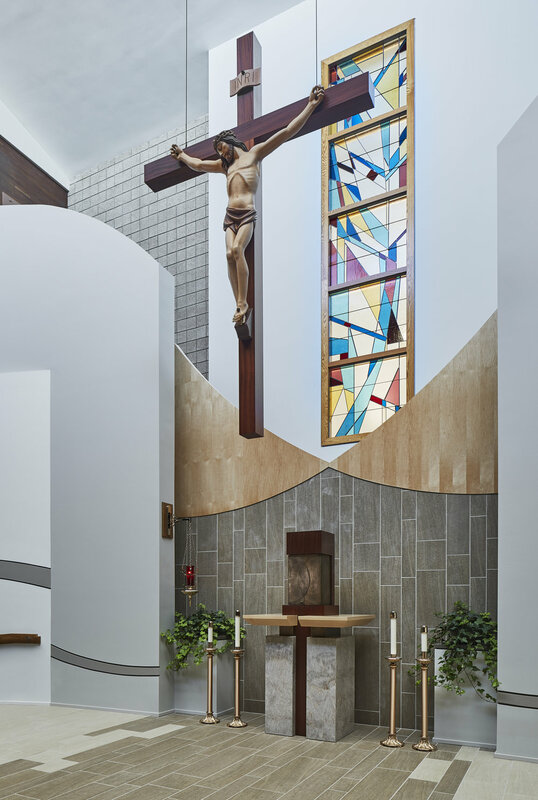 The goals of St. Dennis Parish’s new Sanctuary and music spaces were to provide a redesigned reredos wall backdrop for the Sanctuary Platform, location of a new tabernacle on the sanctuary platform, redesign of the flanking music area for additional space and more flexibility, reorder of storage and support spaces previously behind the existing reredos wall, renovation of the existing chapel, and relocation of reconciliation to provide greater presence. GROTH Design Group was also responsible for Liturgical Furnishing Design, including the Font, Altar, Ambo, Tabernacle and Crucifix. The heart of the design was found in the “vesica piscis,” an almond shaped Christological symbol. The symbol appears prominently in the Altar, Ambo and Tabernacle. Finally, as part of this project, the kitchen and restrooms were remodeled/updated, including an ADA-compliant family restroom.